Hello friends. It certainly has been a while. Between working at work or working on the house, my sewing machine sat untouched for a month or more. We were both getting quite lonely. So I took the week off from working on the house and made a challenge quilt for the 2014 Pantone Quilt Challenge. Entries are due today, so this morning found me restitching a small area and clipping the last few strings. Again… I squeaked in just before the deadline. This year’s challenge color for the Pantone challenge is Radiant Orchid. The entry must contain at least a small amount of Radiant Orchid fabric — although any winning quilts will certainly feature the orchid color. 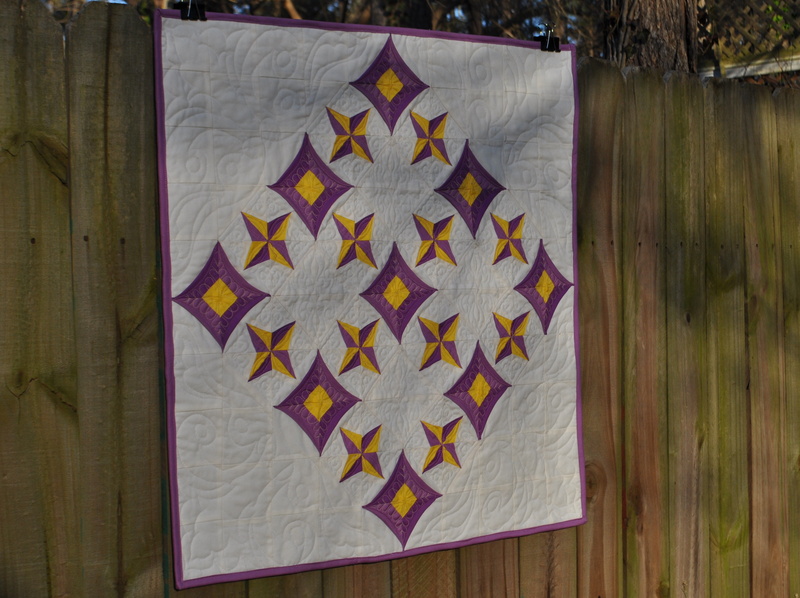 My quilt features the radiant orchid color along with a somewhat darker purple color, with yellow as an accent. And it’s all solids! I do believe this might be my first all solid quilt. I started designing this pattern last summer before I knew anything about the Pantone challenge, but I thought it would fit the challenge perfectly. It went through several revisions until last week when I finally decided that this pattern is the one I would go with. It was slightly tricky trying to figure out how to piece since the star points were ending up in the middle of a curve for the window. I finally decided to use a combination paper piecing/peeled-back patchwork method. I don’t know if it’s a real method for quilting — I just made it up since it seemed to be the only way to put the thing together. And I ended up having to break it down even further and make 4 blocks for each block that I designed. And then half-way through, I redesigned one of the blocks because I didn’t like the way the seams looked with the other blocks. I still have points that are very thick — I think it provides dimension! It measures 25-1/4″ square — each block is 2-1/2 includes and the border added a little bit — so it makes a nice wall hanging. I think I’ll hang it in the spare bedroom over the dresser. I also designed the quilting for each of the blocks and it ended up taking just just as long to do as the piecing. And the thick seams were challenging to quilt through without having the foot get stuck on them. But it’s done and I really like how it turned out. I’ll probably never make another one though… ha ha ha. Be sure to check out the other entries for the challenge. We have some very talented quilters. 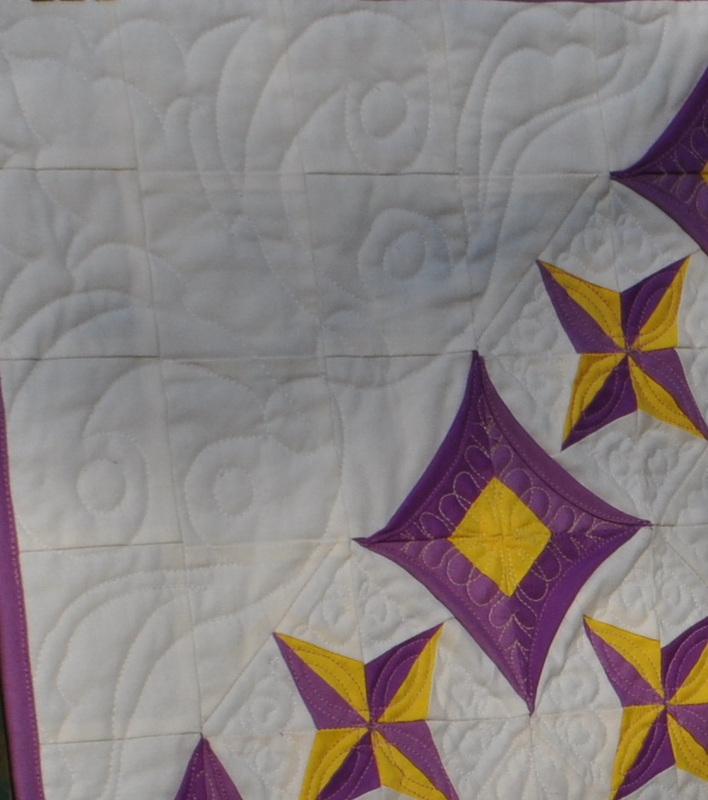 This entry was posted in Quilting/Sewing and tagged challenge, modern, pantone, paper piecing, peeled-back patchwork, purple, quilt, quilting, radiant orchid, star, window, yellow by monkeyneedle. Bookmark the permalink. I love the orchard and gold combination. A Lovely finish. Fantastic – great work using the challenge to explore an all solid quilt. The curves are lovely! So lovely! I love the mix of the soft curves with the harder angles of your other blocks, such a great job! I love the colors you chose, they are very royal together! The design is beautiful, and I can’t believe how much work you went through to make those points appear in those curved sections. Amazing! Beautiful work! Wow! This is gorgeous! I love the colors and the pattern. Beautiful quilt! I love the purple and gold combo! 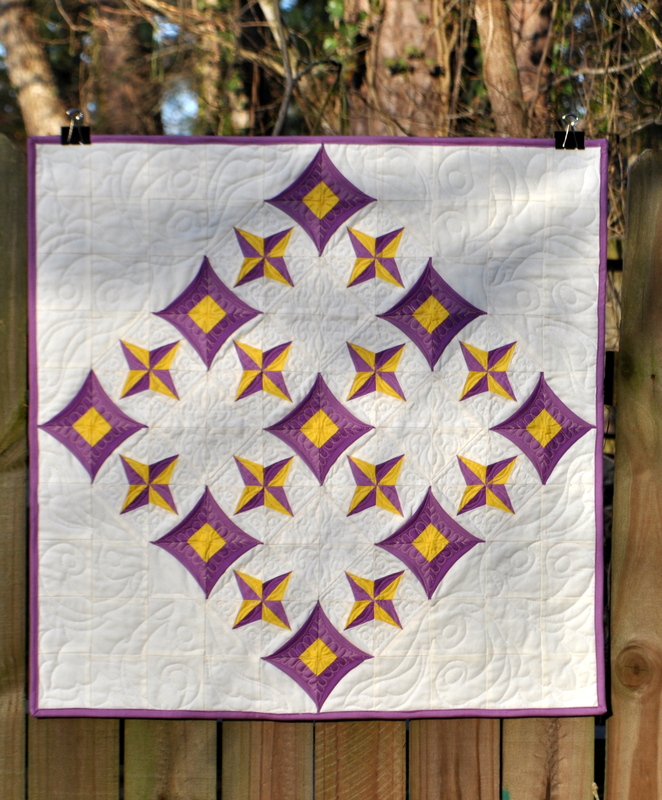 A great pattern to show of your quilting skills. Your quilt is drop-dead gorgeous! I love the colors. Your design is outstanding. In my opinion, you win the prize! Very pretty — love the colors and the design – will you publish it ? Love it. I like how the stars play off of the windows.